On the 18th January 1912, Captain Robert Falcon Scott, along with his team put their union flags into the snow at the South Pole. This was what they had all been striving for, but the experience was embittered by the circumstances. The Terra Nova team (Scott, Oates, Wilson, Bowers and Evans) had missed being the first ever to the pole by just 33 days. They were malnourished, exhausted and suffering from frost bite. Putting their flag next to the Norwegian one put their only a month earlier, soon they would be embarking on a journey that none of them would ever finish. On the 18th January 2019 we opened our Antarctica 2019 season. 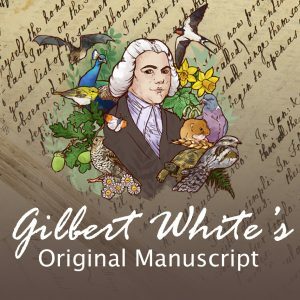 The season which ends on the 28th April includes five fascinating lectures on five very different aspects of Antarctica in 2019, a half term full of Antarctic themed activities and a small exhibition in the museum’s new Discovery Room. The exhibition includes some of the jewels of our Antarctic collections that don’t feature in our permanent Antarctic gallery. 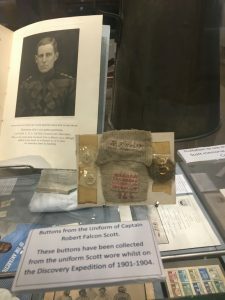 It includes items belonging to Lawrence Oates and Scott before the fateful Terra Nova Expedition such as the loudhailer to Lawrence Oates’ yacht and buttons from the uniform of Scott during his time on The Discovery. It features items used on the Terra Nova expedition, such as a pair of dog shoes, used to protect paws from the ice, and artefacts from after the expedition, letters of condolence to Lawrence’s mother, an order of service from a memorial led by Oates’ regiment and an invitation to see the unveiling of a memorial to Scott. 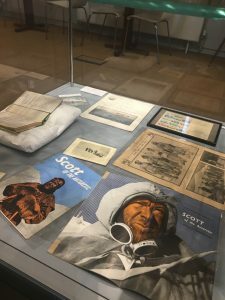 The exhibition features items showing the popularity of the expedition, merchandise from the premiere of Scott of the Antarctic, stamps and a post card publicising that Scott used shell petrol for his tractors. Some of the memorabilia was signed by surviving members of the Terra Nova expedition decades afterwards. The most exciting addition to the exhibition is the plates from The Aurora Australis. The Aurora Australis was the first book to be written, printed, illustrated and bound in the Antarctic, during the British Imperial Antarctic Expedition or the Nimrod Expedition (1908–09) led by Ernest Shackleton. It was produced entirely by members of the expedition, as a method of keeping away ‘the spectre known as ‘polar ennui’’. There are very few copies of the Aurora Australis, and we are very lucky to be able to display some of the illustrations. 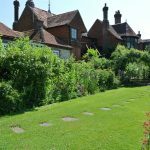 The exhibition will be up until the 28th April and is free to see with admission.